Looking for drought-tolerant plants for your ornamental garden or arid landscape? Look no further because you might find what you’re looking for on this roundup. These are gorgeous drought-tolerant plants you won’t believe thrive with little to no watering. If you’re particular with water conservation, then heat and drought-tolerant plants are your new best friends. Here’s an extensive list of drought-tolerant plants you’ll fall in love with! 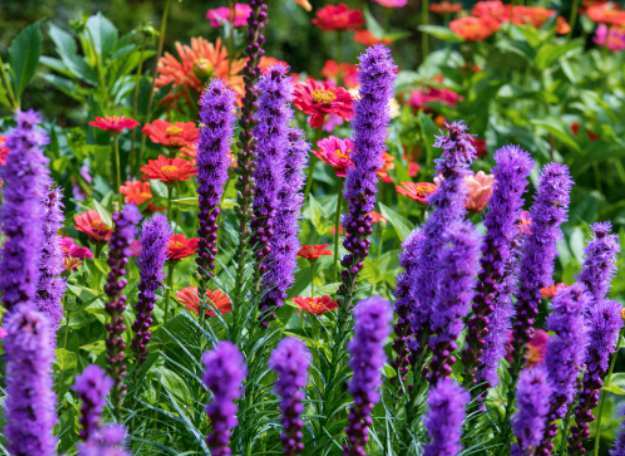 Turn heads with these interesting perennials in your front yard landscape. Wait till it flowers and you’ll have more curious onlookers–which is in some 10 to 20 years to be exact! African daisies will wither on a dry spell, so what got them into this list of drought-tolerant plants? They’re hard to kill once they’re established and they don’t really wither and die. They only go dormant or go into survival mode. Don’t be fooled by these lovely and dainty blooms. Penstemons thrive on neglect. They will only feel at home in your waterless garden. If you want a cottage flower garden in your arid landscape, black-eyed Susans are your go-to plants for a flower garden running riot in your dehydrated garden. It’s amazing how these flowers can thrive on both ends of the weather spectrum. From a dry spell to a bitter winter, blazing stars will bloom in your garden. Spanish villas and a Mediterranean landscape are never without these lovely blooms. 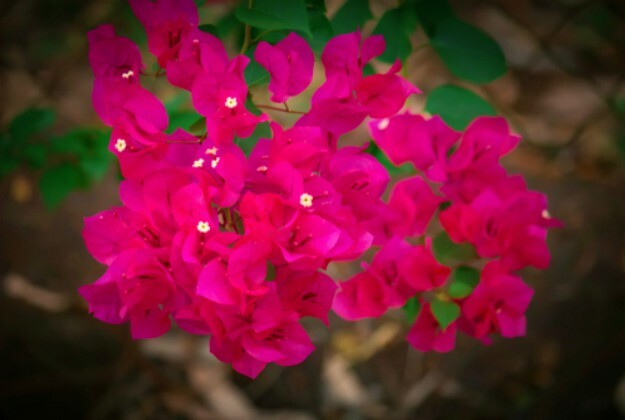 Bougainvillea is proof of how you can maintain a lovely flower garden in a dry landscape. Some former growers may pass up on this drought-tolerant plant. Bugleweed or carpet bugle can be invasive but in a parched landscape, you can tame them. Invite butterflies and hummingbirds to your garden with dainty butterfly weeds. These beautiful flowers thrive in a dry landscape. They are also a favorite to the Monarch butterfly. 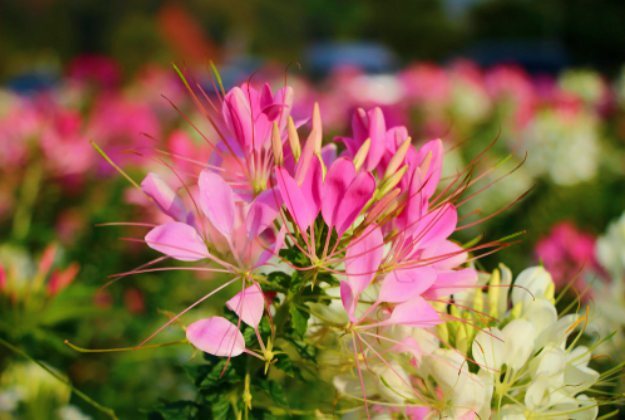 An English cottage flower garden is possible in arid landscapes with drought-tolerant flowers like cleome which adds character to any flower garden. Not only is it lovely in pastel, it has an interesting wispy form. What could be more drought-resistant than cactus? They do thrive in a waterless environment. You’ll love even their thorns which help quench their thirst. With hundreds of variety–it will always be interesting. This annual climbing plant with small yet gorgeous red flowers is perfect in a trellis, fence, or arbor. That is if you have a small garden and a clematis won’t do. Large flower heads and showy blooms are perfect backdrops for your dry landscape. Coneflowers, being a member of the daisy family, are dependable even with an inferior and dry soil. You’ll also love this flowering vine with dainty pink or white flowers for your trellis or arbor. You can grow them from seeds but the tubers will grow back even with frost damage. Another beautiful flowering annual plant which thrives even in neglect. Growing cosmos in a fertile soil will only produce verdant foliage and fewer flowers. This isn’t exactly what you are looking for in your flower garden. One of my favorite perennials, daylilies aren’t considered ‘the perfect perennial’ for nothing. What lovely blooms and brilliant colors for a variety which is both drought and frost tolerant! One of the most familiar flowers in a desert or arid landscape is the Adenium obesum. Its common name, desert rose couldn’t be any perfect. It may shed its foliage in a cold or dry spell but the blooms will flourish to your adoration. The thorns may intimidate you but the flowers will definitely win you over. One of the most interesting drought-tolerant plants is the crown of thorns. They will interest you more with the variety of colors, sizes, and forms. Blanket flowers or Sundance are best appreciated in the wild. But you can grow a few in your sandy well-drained soil. With a high tolerance for drought, they do best in a hot climate in full sun. Did our list just get even more interesting with this amazing entry? A bulb can cost a few dollars, but you can boost your dry landscape with this beautiful oddity. Lantana is common in the tropics and is even classified as invasive. But with trimming and care, you can grow it to your preference. With a profusion of different colors, you can grow a cottage flower garden in a dry landscape. 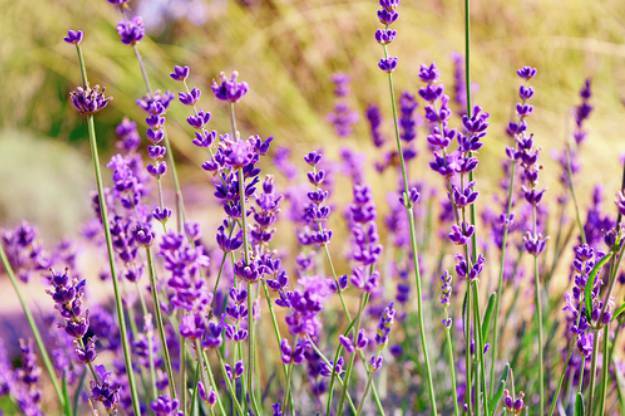 One of our favorites, lavender is simply extraordinary. Valued for more than just its looks, it is both an ornamental and essential herb. It is also a plant that can withstand both a dry spell and a frost. One of the most familiar summer plants growing in dry conditions is the marigold. To make your vegetable garden colorful, grow marigold among your veggies. They will also help drive away pests. Featured in 1998’s The Mask Of Zorro, Romneyas, are indeed, native to California and Northern Mexico. A white flashy flower head with an intense yellow center deserves a spot in your arid garden landscape. Oleander is native to the Mediterranean region to the Arabian peninsula. It is also found in tropical regions around the world. Take care though. This beautiful drought-resistant plant is one of the most poisonous ornamental plants. Primula, as a drought-tolerant plant, is due to its ability to thrive in inferior soil. You can find them in arid to dry landscape from the rocky Himalayas to boggy meadows. Some varieties of purslane belong to the weed class. Its hard to kill and spreads fast. Use this to your advantage and grow an Alpine meadow-like landscape. Yes, even in your waterless garden. Grow scarlet sage with the drought-resistant purple wild sage. You will get a cottage flower garden-like landscape. A flower garden with an explosion of colors is possible even in a dry, sandy, and rocky landscape. If you’re looking to do a xeriscape for your dry landscape, stonecrops or ‘sedum’ would be great. It is a leaf succulent flowering plant which does well in a rocky landscape. Succulents are all the rage these days with different varieties and interesting colors and forms. Besides that, its resistance to drought probably made it an endearing garden and indoor plant. If not totally drought-tolerant, sunflowers are definitely summer flowering plants. Not only are they great for your landscape, both the seeds and the young flower heads are edible too. Torch tithonia or Mexican sunflower will light up any flower garden indeed. Its bright red-orange flowers will turn heads even when grown with other drought-tolerant plants. Some species of Verbena wear the colors of the stars and stripes. 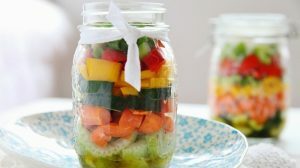 This makes them great for your summer garden in planters or hanging pots, not just for the Fourth of July, but for a patriotic look all summer long. 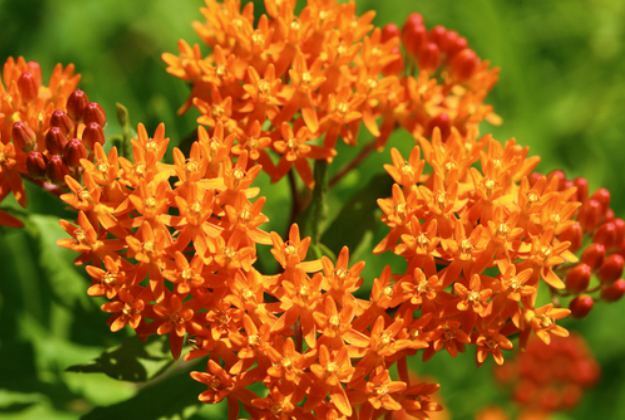 You can trust these lovely blooming flowers to thrive in your garden with little care. On hot and dry summer days just sit back and relax and these flowers will flourish all on their own. For a plant called Whiteweed, the flowers are commonly blue, which is great for your dry garden. For a flower color which can be hard to grow, ‘ageratum’ is a great choice for your arid landscape. Like most variety from the sage and salvia family, the wild sage sure is drought-resistant. Grow a drought-tolerant landscape with wild sage as an addition. You would do well to include yarrow in your dry garden landscape with its beneficial herb properties. It has long been used as food, to make tea, dried as a cooking herb, and was once a popular vegetable. You have a bonus in this low-lying dry-resistant plant which thrives in rocky terrain. It has a sweet smelling scent which earned it the nickname of sweet alyssum plus it has dainty yellow flowers in clumps. One of the mainstays in a desert to semi-desert landscape is the interesting yucca. It is similar to agave, only reserved or smaller in form and has conventional flowers which bloom in shorter time than agave. Zinnias look a lot like Mexican sunflowers though they have a wide color variety. From red, yellow, orange, and pink, you can grow a rainbow flower garden even in a dry landscape. There you go, homesteaders! Drought-tolerant plants perfect for your dry or arid landscape. A dry spell wouldn’t be much of a concern now with these trusty plants to choose from! Which drought tolerant plant will you be adding to your homestead? Let us know in the comments section below! Editor’s Note: This post was originally published on August 9, 2017, and has been updated for quality and relevancy.